After trading relatively flat on Monday, crude oil prices crept a bit higher on Tuesday morning due to escalating tensions between the United States and Iran. - The market share of crossover utility vehicles (CUVs) has climbed dramatically in recent years, mostly at the expense of cars, even as gasoline prices have increased. - Since September 2017, sales of CUVs have exceeded those of cars. 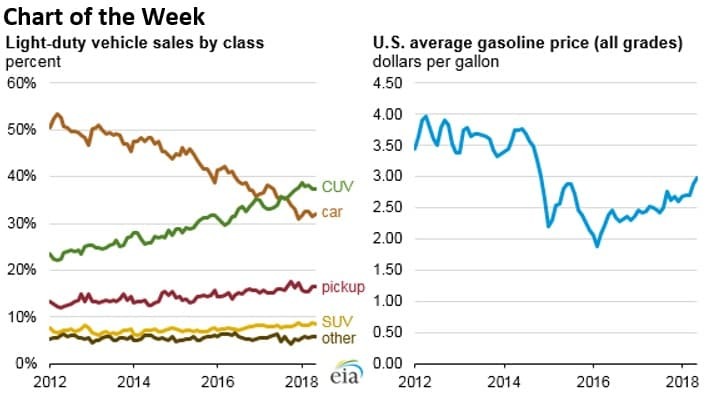 - Still, CUVs have fuel economies only slightly worse than cars, and unlike SUVs and pickups, CUVs are built on more fuel-efficient, car-based platforms. • Phillips 66 (NYSE: PSX) is restarting its gasoline production unit after being offline for several weeks because of a fatal accident on July 4. • Royal Dutch Shell (NYSE: RDS.A) says it will begin exploration on two blocks off the coast of Mauritania after the government approved production sharing contracts. 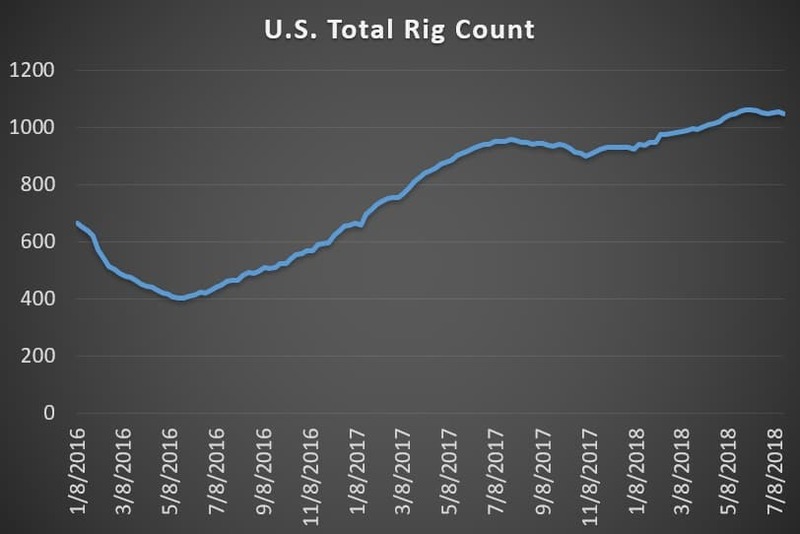 • Ocean Rig UDW (NASDAQ: ORIG) announced several deals for its rigs, and said it is seeing "higher levels of inquiry in the market that we expect will translate into higher utilization in the coming months for the overall floater fleet." The series of deals suggest offshore activity is picking up. Iran war would mean $150-$200 oil. President Trump and Iranian President Hassan Rouhani traded threats over the weekend. Trump said on twitter in all-caps that Iran would “SUFFER CONSEQUENCES,” but oil prices gave up early gains on Monday, with traders seemingly dismissing the potential conflict between the U.S. and Iran. "I think the market's a little complacent," Bob McNally, founder and president of energy consultancy The Rapidan Group, told CNBC. Most analysts do not view conflict as necessarily likely, but if Iran shut the Strait of Hormuz, as Iranian officials hinted at, it would cause a painful shock to the oil market. "The numbers on a blockage or any kind of upset or military situation in the Strait of Hormuz, that is off to the races. Pick your number — $150, $200 — it goes sky high," John Kilduff of Again Capital, said on CNBC. "Because we are talking about an abject shortage of oil then in the global market." Permian should be “ripe” for M&A, but quiet thus far. The Permian should be “ripe” for M&A deals, but the basin has been unusually quiet since Concho Resources (NYSE: CXO) paid $9.5 billion for RSP Permian earlier this year. There has been $35 billion worth of deals so far this year, down by nearly half for the same period in 2017. “The oil and gas world has not had a lot of corporate M&A, certainly relative to other sectors,” Jay Horine, global head of energy investment banking at JPMorgan Chase & Co., said in a Bloomberg interview. The pipeline bottleneck in the Permian and the discounted prices for Midland crude are scaring away investors, and the battered stock prices of Permian-focused drillers have made deals difficult. Analysts say that will change next year when pipelines come online, which could usher in a wave of M&A activity. Strong profits raise questions. The oil and gas industry is set to unveil strong profits for the second quarter, which raises questions about what the industry will do with their newfound piles of money. Last year, investors demanded capital discipline, with a focus on shareholder returns. That message is still being sent to executives, but the difference is there is now more cash to use. “The market is still very focused on capital discipline. That doesn’t mean don’t spend, it means spend it well,” Ryan Kauppila, fund manager at Putnam Investments, told Bloomberg. Earnings reports, which kick off this week, will offer clues into the strategies of a wide variety of drillers. Trump admin wants to strip California of regulatory authority. The Trump administration is trying to roll back national fuel economy standards for the nation’s auto fleet, but integral to that is taking away California’s unique authority to set its own standards. Automakers have wanted to avoid a patchwork of regulations and have pleaded with the Trump administration to come to an agreement with California. Instead the federal government plans on trying to take away the state’s authority in what could turn out to be a protracted legal fight. U.S. oil replaced lost Libyan barrels in Europe. Italy imported a record volume of oil from the U.S. in June, covering for barrels that typically come from Libya. The closure of Libyan ports forced Europe to look elsewhere, and the imports from the U.S. demonstrate the growing role that the U.S. is playing as an exporter. ExxonMobil hikes estimate for Guyana assets. ExxonMobil (NYSE: XOM) and Hess (NYSE: HES) increased the estimate for the recoverable reserves in the Stabroek block off the coast of Guyana by 25 percent. The oil companies now believe the block holds more than 4 billion barrels. Oilfield service giants miss on quarterly earnings. Schlumberger (NYSE: SLB) and GE’s Baker Hughes reported disappointing figures for the second quarter, a sign that the offshore drilling has not yet picked up as much as hoped. Schlumberger’s revenue grew 11 percent in the second quarter, less than expected. The modest figures suggest that offshore drilling activity is rebounding at a slow rate. LNG has avoided trade war…for now. The U.S.-China trade war has spared the LNG market thus far. However, the threat by Trump to impose $200 billion of tariffs (or even as high as $500 billion) would conceivably be met with a Chinese tariff on imported LNG from the U.S.
Related: Has Saudi Arabia Fooled Oil Analysts? Oil majors more gas heavy than before. The oil majors continue to pivot towards natural gas, with gas output at the five largest majors up by a combined 15 percent over the past decade, according to Wood Mackenzie. The trend is expected to continue. “LNG is the growth commodity for these companies,” Brian Youngberg, an energy industry analyst with Edward Jones, told Reuters. Hedge funds cut bullish bets. Hedge funds and other money managers continued to liquidate their bullish positions on oil futures, with the selloff occurring at its fastest rate in more than a year last week. However, the reduction in net longs occurred via liquidating long bets, as opposed to a rise in short positions. That suggests profit-taking and a pause, rather than a confidence in a bearish trajectory for oil prices. The market was overly bullish in the first quarter, so the latest reduction in net length results in a bit more balance. Shell in talks to divest $2 billion from Nigeria. Royal Dutch Shell (NYSE: RDS.A) is reportedly in discussions to exit from the troubled Niger Delta, which has plagued the Anglo-Dutch oil major for years. The potential sale could reach as much as $2 billion. Shell rumored to begin share buybacks. Analysts and shareholders expect that Shell will announce a major share buyback program later this week, after having issued scrip in lieu of dividends during the market downturn a few years ago.